Further, as per latest Annual Survey of Industries: 2012-13, the total number of units in the registered food processing sector in the country was 37,175. 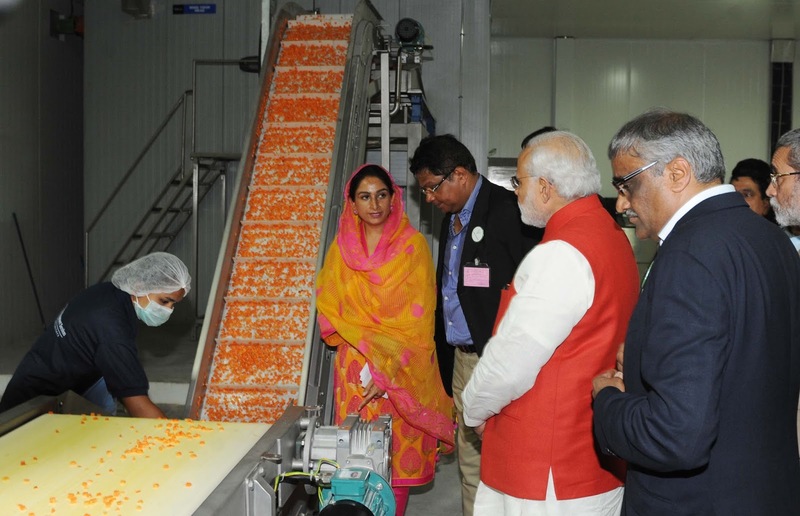 As such, share of small & micro food processing units which are being managed by women in rural areas of the country in the registered sector is more than 30% in comparison to overall registered food processing units in the country. The Government has accorded Final approval to 13 (Thirteen) proposals for setting up of Mega Food Parks in various parts of the country including rural areas during the current Five Year Plan period till date. These Mega Food Parks are private sector driven projects and responsibility of execution, ownership and management of these projects vests with a Special Purpose Vehicle (SPV) which is a company incorporated under the Companies Act. State Government/ State Government entities/Cooperatives have also been allowed to set up Mega Food Parks in the country by recent amendments in the scheme guidelines w.e.f. 10.02.02014. State-wise and location-wise details of the thirteen Mega Food Park projects accorded Final approval by the Ministry during the current Five Year Plan Period and the grant released to these projects are as below. These Mega Food Parks are currently in the process of implementation. On completion, direct and indirect employment for about 30000 persons is likely to be created by each of these Mega Food Parks. Making changes/modifications in the Scheme Guidelines is a continuing process and based on the experience of implementation of Mega Food Parks, the scheme guidelines have been revised by the Government from time to time to remove the hurdles in the implementation of the projects. (i) Dr. S.S. Negi, IFoS (HP:80) as Director General (Forests) and Special Secretary, Ministry of Environment, Forests & Climate Change vice Shri S.S. Garbyal, IFoS (UT:77) consequent to his retirement on 31.07.2015. (ii) Additional charge of the post of Chairperson, Food Safety and Standards Authority of India to Shri Bhanu Pratap Sharma, IAS (BH:81), Secretary, Department of Health & Family Welfare for a period of three months beyond 03.07.2015 or till the appointment of a regular incumbent or until further orders, whichever is the earliest. Ministry of Railways have decided to grant automatic refund of Confirmed/RAC e-tickets on cancellation of trains similar to waitlisted e-tickets. There shall not be any requirement for cancellation/filing of TDR for refund of e-tickets in case of cancellation of trains. This has become effective with effect from July 13, 2015. However, in case of cancellation of trains, PRS counter ticket shall continue to be refunded across the reservation counter as per the existing provisions. The Union Minister for Road Transport & Highways and Shipping, Shri Nitin Gadkari said that the people of North East have lot of expectations and infrastructure development in the north eastern region of India is of utmost importance for the socio-economic development of the people there. The local communities should be engaged in the construction work and thus providing the avenues of employment and development to them. He was speaking on the occasion of the Inception Day function of National Highways and Infrastructure Development Corporation Limited (NHIDCL) in New Delhi yesterday. The NHIDCL is a Public Sector Undertaking of the Ministry of Road Transport and Highways and was incorporated on 18th July 2014 with an objective to fast pace construction of National Highways and other infrastructure in the North Eastern Region and Strategic Areas of India. Shri Nitin Gadkari said that the NHIDCL has taken a challenging task and it should make all efforts to convert it into an opportunity. The Minister also emphasized upon the monitoring of the projects. He said that transparency and fast-track decision making are essential for the successful functioning. While addressing the gathering, Shri P. Radhakrishnan, MoS for Road Transport & Highways and Shipping said that the Prime Minister has been taking keen interest in the development of North Eastern region of the country. He said that infrastructure development in the border areas will help in boosting of cross-border trade and investment. He also said that the NHIDCL can enhance the pace of development with the help of stakeholders including local contractors and make them an important partner in the development of infrastructure. It can also be a catalyst for the employment, the MoS added. Those who addressed the gathering also included Shri Vijay Chhibber, Secretary, Ministry of Road Transport & Highways, Shri Deepak Das Gupta, former Chairman, NHAI and Shri Anand Kumar, Managing Director, NHIDCL. Senior officials of Ministry of Road Transport & Highways and NHIDCL were also present on the occasion.